The Department for Transport has denied a Local Enterprise Partnership’s (LEP) claim that its bid for sustainable transport funding failed because it does not have a devolution deal. Last month the DfT announced the winners of £20.6m funding in its Sustainable Travel Transition Year’ 2016/17 revenue competition. D2N2 LEP, which covers Derbyshire and Nottinghamshire, complained that its £2.4m bid was unsuccessful because the area had so far failed to reach a devolution deal with ministers and ‘despite the authorities and the D2N2 area’s very strong track record in sustainable transport’. However, a DfT spokesperson told Transport Network: ‘Our £21m of funding for cycling and walking schemes will cut congestion and improve air quality for towns and cities across the country. The DfT said the competition was fairly judged in line with its published assessment criteria. Not all the winners currently have devolution deals. Despite the DfT’s assertion that it allocated £21m of funding for cycling and walking schemes, many of the successful bids were for a mixture of cycling, walking, public transport and other measures. 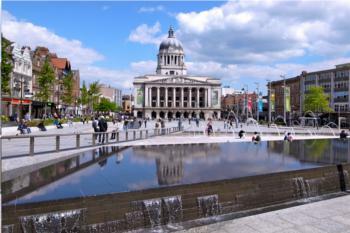 Nottingham and Derby are among of five English cities required to have a Clean Air Zone by 2020 to tackle toxic air pollution.